The best way to get to know a community is by scheduling a tour. See the facilities, meet the staff and residents, and get a feel first hand what it's like to live at Vi at Aventura Assisted Living. Vi at Aventura, Florida invites you to expect more. We offer freedom and independence, but with the supportive services and continuum of care including assisted living, memory care and skilled nursing to allow our residents to age in place. Vi communities are dedicated to redefining senior living. We offer uncompromising luxury and unexpected value, having blurred the lines between retirement and resort for over 25 years. Let us manage the day-to-day concerns like housekeeping and meal preparation, allowing you to worry less and live more. Even before you walk in the door of Vi at Aventura you will be greeted with luxury resort-like surroundings including beautifully landscaped grounds and outdoor seating areas. Our front desk staff is available around the clock to welcome residents and guests. Lavish community rooms include a billiard, card and game room, a large auditorium as well as private event spaces. Start your day by being pampered with a relaxing visit to our salon and spa, followed by coffee and a book in our well-stocked library. Alternatively, you could dive into an exercise routine, guided by a personal trainer, in our state-of-the-art fitness center--the choice is yours. No detail is overlooked with the huge selection of gorgeous private apartments you may choose from. With one-, two-, three-bedroom apartments and more, there is ample choice to consider when you select your home. Vi at Aventura provides a continuum of care, including both short- and long-term options through our care center. Our services are tailored to respect individual privacy and promote personal dignity, allowing residents to age in place. By conducting an initial evaluation, we craft an individualized service plan and update it according to your changing needs. Whether you need help with activities of daily living or medication management, we are there to serve you. We offer memory care to support those with mild-to-moderate Alzheimer's or similar cognitive disorders. With a soothing and relaxing care setting we can help residents adapt to their environment better. Our skilled nursing center is located on-site as well, ensuring that residents with high care needs don't need to leave the comfort of our community. We also provide physical, speech, occupational therapy and other services on-site, forming a comprehensive wellness environment. 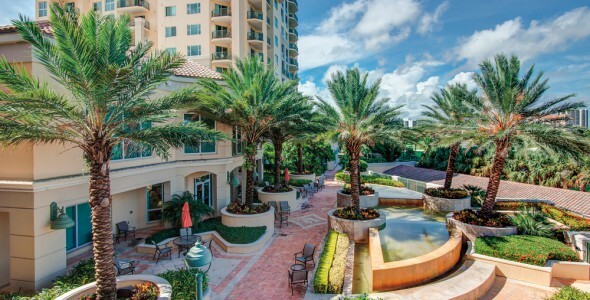 Experience senior living, redefined, when you visit Vi at Aventura.